When people plan a trip to Thailand, their plans usually include visiting the main tourist sights of Bangkok. And while places like the Grand Palace, Chinatown, and seeing the reclining Buddha at Wat Pho shouldn’t be missed, visitors must also make time to explore beyond the main tourist zone. Checking out some of these off-the-beaten-path sights will help visitors get a sense for the real Bangkok and Thailand culture. After all, that’s what traveling is all about…right? Here are our recommendations for 5 things to do in Bangkok Thailand that will take you outside the tourist zone. This authentic floating market is only held on Sunday afternoons. It is off the beaten tourist path a bit, but you can get their by taxi fairly easily from central Bangkok, or you can even take the train from Thonburi station (on the west side of the river). If you take the train, it is only a couple stops away! We found a few crafts and other goods at this market, but mainly we noticed that it was all about the food! You can walk up and down examining the different foods. So bring some cash and be ready to snack! This is a great place to have “a little of this” and “a little of that” all afternoon. There is also a larger “food court” area, which is essentially a large floating vessel where you sit community style, and small boats off to each side, each with a different specialty. A great place to enjoy authentic local Thai food! When we travel, we enjoy seeing the main sights, but we also really like to get away from the main tourist zones to see what the place is all about. In Bangkok, we enjoyed checking out the local neighborhood that we were staying in. This area of small neighborhood streets near Bangrak (south of the old city on the east side of the river) is a 200 year old Thai neighborhood, and you would be hard pressed to find another westerner around here. Each day we stepped outside our door of our Airbnb and wandered this neighborhood, checking out the local Bangkok markets and restaurants. We loved supporting these local families and feeling immersed in their culture. We found some of the best (and cheapest) food in Bangkok here, and some of the most friendly people. We’ve been to Bangkok a couple times, and wandering these local neighborhoods provided some of the best memories! So please, take some time away from the main tourist zones — where you will over pay, and not have as good of an experience. Lumphini Park is like the Central Park of Bangkok. This massive green space is located right in the middle of the city and is easily accessible by all forms of transportation. It’s nice to visit in during the day, with plenty of green space to relax, playgrounds for the kids, and even a lake with boats that you can rent. But as the sun is going down, the park comes alive with people who want to workout without the blazing heat. Running, yoga, and aerobics classes are all over Lumphini Park in Bangkok at night! With more than 2 kilometers of running paths going all around the park, and it is packed with people. You will also hear music pumping in the distance around the park. As you get closer, you will see large aerobic classes taking place — with upwards of 50-100 people! You can hear the energetic coach cheering them on and getting everyone pumped up. This is a lively time to stroll through the park, even if you don’t feel like getting your sweat on. Things to do in Bangkok, Thailand – #4 Have Dinner from This Guy in Chinatown! When you find a great dining spot in Bangkok with this kind of ambiance and entertainment, you can’t help but want to tell everyone about it! We’ve talked about this guy a couple times, but seriously, you must check him out! We don’t know his name, or the address of his outdoor restaurant…but you must go here in Chinatown in Bangkok! Heading to Chinatown at night is always an adventure, the place really comes to life. This is a great place to spend the evening checking out some of the unique shops. Off of the main road of Yaowarat heading southeast, you will come to the intersection of Yaowarat Soi 11. You should see market / food stalls on both sides, and lots of people buzzing about in the evening. Take right, and walk past some of the vendors. Not very far down the street you should see him, and his flames! This guy is a cooking machine, and he puts on a bit of a show. Have a seat at his “restaurant” – which consists of plastic tables and chairs with a great view. Order something tasty off the menu and get your camera out. We guarantee you, this is the cheapest dinner show that you will find in town. A great evening out! A great dinner…and a great show in Chinatown – Bangkok, Thailand! What is a visit to Bangkok without a massage? We are a sucker for massages, they are our guilty pleasure for sure. And it’s hard to turn down a massage in Thailand where they are so much cheaper than back in the States. 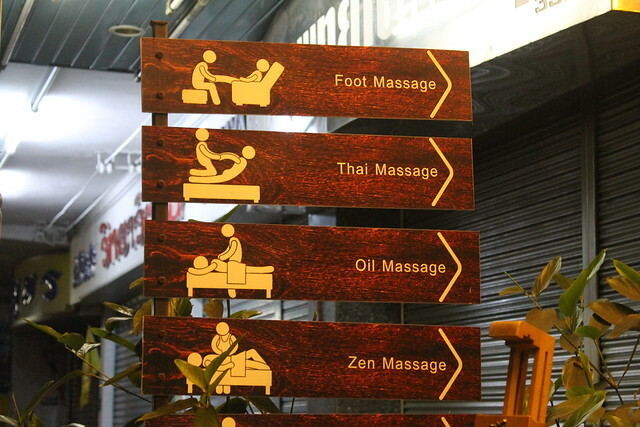 Besides the foot reflexology (which I’m a bit addicted to), the authentic Thai massage is the way to go here. We recommend splurging for the 2 hour Thai massage because that is the best way to get the full effect. Thai massage incorporates traditional massaging techniques along with a lot of stretching. Basically, they will get you good and relaxed by massaging and loosening all of your muscles systematically. Then, those tiny yet amazingly strong therapists will twist, pull, push, and contort your body in different ways! Essentially, they are re-aligning your joints and stretching everything. It’s not for the faint of heart, because if you are like me, the sound of my shoulder popping freaks me out! But honestly, if you can get through it, you will feel incredibly relaxed and rejuvenated! It can be a bit awkward at times, as the therapist gets pretty personal into your personal space while this is happening…but it’s professional. Unless you are looking for something a bit more risqué, then there is nothing sketchy about it. Have You Visited Bangkok Thailand? Whenever we travel, we enjoy finding unique activities and things to do that are outside the main touristy areas. We have actually been to Bangkok a couple times, but it’s a big place and there’s a lot to do. Of course, we know that people will go check out the Grand Palace and Wat Pho, I mean, they are pretty awesome…and you can’t NOT see them. But we highly recommend that you get out and explore other things to do in Bangkok! Do you have any unique recommendations for things to do in Bangkok? Please share in the comments below! We also had a really enjoyable boat trip through the canals in Thonburi. People use boats to get about and sell their wares in this part of town. It was a great experience and interesting to see. Did you go there? Thanks for the comment Sarah! We were in the area of Thonburi, but sadly we didn’t have a chance to take a boat trip through the canals. I’m sure it would be awesome! Overall, Bangkok has it’s pros and cons for sure! There are certain areas that we really like too. We’ve had good experiences in the Silom area too, as well as near the Victory monument. Overall, I think that when you get out of some of the major touristy areas it can be enjoyable. Especially when you meet some great people to chat with! Have fun in Chiang Mai, we LOVE that area in the north too. Thanks So much for this! Loved the ideas! Really wanted to find the guy at China Town but has not luck. Anyway, my friend and I found this very useful! Thanks so much agin! My husband and i have visited Bangkok 4 time, we will be back in May as part of our 3 week tour. When in Bangkok yes do the touristy things but Ayuthaya is a must. This old ancient ruins once was the capital of Bangkok it historically beautiful and very interesting. Spend abit of time talking to the locals. We have seen this sight during the day and at night its flooded with lights, a truly magical experience!!! Thanks for the great info very informative.